Jan. 2004: We are happy to announce that we have signed an agreement with Ydreams, a Portugal based company, for the distribution to the region of Undercover, a mobile telephone based game. Nov. 2003: We signed the contract with the Servicio Geografico Militar (Uruguayan Geographic Military Service, the National Mapping Agency of Uruguay) in order to provide MapSN. 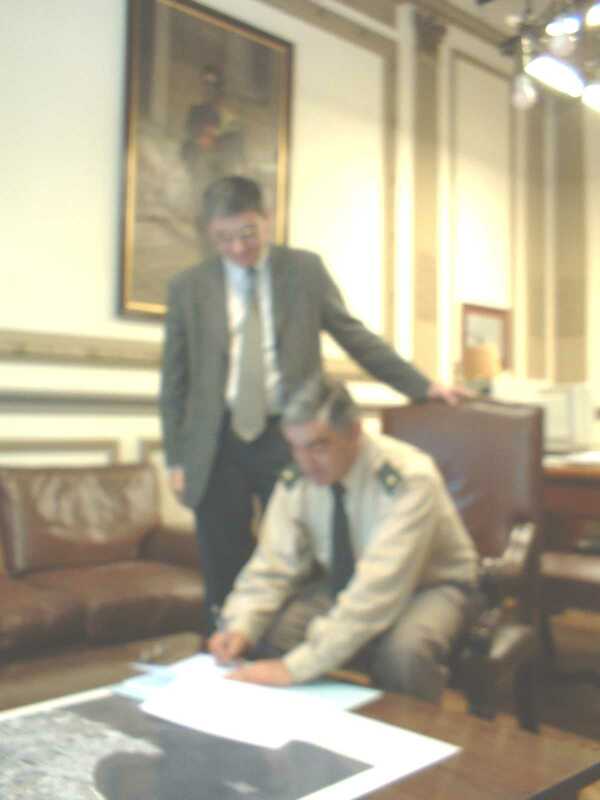 To the left, the image shows the moment when Col. Artigas Bacci, Head of the Servicio Geografico Militar, signs the document while with Dr. Carlos López, head of The Digital Map Ltd.
Aug. 2003: Dr. Carlos López makes a presentation at the Chilean Military Geographic Institute (Instituto Geográfico Militar de Chile) describing in general the technology of copyright protection by watermarking, and in particular, MapSN. Jul. 2003: Dr. Carlos López attended the Cambridge Conference 2003 and presented a paper about the tests performed to MapSN by the Uruguayan Military Geographic Service. A copy of the presentation is available here. Dec. 2002: The Committee at Programa de Desarrollo Tecnológico approves the project "A Service for the Watermarking of Digital Maps" presented by TDM. May. 2002: The Advisory Committe at INGENIO approves the project "A Service for the Watermarking of Digital Maps" presented by TDM. Thanks for your time and interest about The Digital Map Ltd.!